The tonno e cipolla pairs marinated tuna with sweet onion (and olives). Nella Grassano ruined pizza for Chicago. Or at least she ruined the notion that even bad pizza is good pizza. That was in early 2006, when she first enchanted us at Spacca Napoli as the taciturn pizzaiola who emigrated from the Boot along with a 13,000-pound volcanic-stone oven. It was a brief and tempestuous affair. Owner Jonathan Goldsmith and Grassano had an unhappy parting all too soon, but not before a light went on in the city's collective consciousness. It was discovered on a wide scale that there was much more to pizza than deep dish and tavern-style cracker crust. In fact, it became difficult to imagine that anything could be better than the Neapolitan ur-pizza—a malleable, brick-oven-fired thin crust with a nucleus that teetered on the edge of sogginess—from which all other pies trace their ancestry. I was reminded of that in the middle of writing this review when I found myself checking out Big Bricks, the second outlet from the owners of Lincoln Park's 15-year-old Bricks. Stylistically, comparing a Bricks (or Big Bricks) pizza to a Grassano is like holding up a pigeon against a swan. But there was a time when I would unquestioningly scarf down BB's stiff, inharmonious, overloaded pies and happily demolish the leftovers for breakfast. These days, there are things I just don't want to bother with anymore. It's difficult to believe it's only been six and a half years since Grassano leveled this landscape. Since then, Neapolitan-style pies are a dime a dozen, along with a proliferation of non-Italian regional varieties about town such as the Quad Cities-style at Roots and the New Haven-style at Coalfire. And arguably, she paved the way for the uncompromisingly artisanal Great Lake, where partisans are willing to wait hours longer for a pie than it took to obtain one of Nella's. More critics—professional and amateur—have tried to write poetry about the geography of Nella Grassano's pizzas than any other. Here's what I wrote about the ones at Scott Harris's Nella Pizzeria Napoletana: the "pizzas, made by Grassano herself, [have] raised, lightly blackened crusts bordering underskirts stippled by constellations of tiny, crispy blisters. These were worthy, foldable delivery vehicles for high-quality toppings like the marinated tuna, olives, and sweet onion of the tonno e cipolla." Grassano's dalliance with the Francesca's jefe didn't last long either, but now she's back, along with her longtime champion and husband, Franco, at Pizzeria da Nella Cucina Napoletana, on a congested stretch of Fullerton in Lincoln Park—with no other partners to stick their thumbs in the dough, according to Franco. I'm excited to say nothing about Grassano's magic with the dough has changed. Her crusts, unlike our homegrown cracker variety, accept heat like an embrace while maintaining their elasticity, resulting in a raised hill of fire-licked crust that surrounds the circular plain of sauce. Scattered with bubbling pools of milky cheese and strewn with imported toppings, it's something at once deeply satisfying and ephemeral. Have you ever met one of those blowhards who claims he can't eat Italian food after eating it in Italy? It sounds silly, but you can see what he means. I used to think it didn't matter what you ordered on Grassano's crusts, but I will venture that what she's putting on top of them these days has changed for the better. According to Franco, the tomatoes, prosciutto, salami, mozzarella di bufala, and burrata all come from Italy, some from Naples (as do the flour and a fascinating all-Italian beer list). 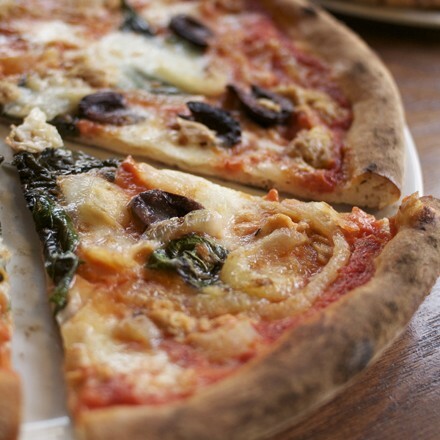 There are 11 different classic variants, from the standard margherita to a four-cheese white pizza. On one visit my table found ourselves eating a mutant: a marinated Genoa tuna and onion pie, augmented with blazing disks of hot pepperoni. As with any of the tomato-based pies, the toppings and crust are joined seamlessly by a glaze of San Marzano tomato sauce, a luminous ray of sweetness and light. Outstanding. Grassano also employs her handiwork in the service of a few other things: a calzone and the lavezzi, a tubular construction not unlike a sectioned burrito, layered with prosciutto crudo and stuffed with smoked mozzarella and grilled eggplant. And among a lengthy selection of classic Italian desserts there's one oddball—a Nutella pizza. On one occasion my table spent a few minutes mocking the idea of it before turning down dessert altogether. A few minutes later it was sent to the table gratis with a round of house-made limoncello. Our hearts sunk at the prospect of attacking it, but we did and it was irresistible: a double-crusted blanket of half-melted chocolate-hazelnut spread covered in a snowfall of confectioner's sugar. (On this same occasion our table was subjected to a relentless swarm of oversolicitous servers, which left us wondering if someone in our party—which included a few other food writers—was marked.) The menu also offers a handful of salads, appetizers, and pastas, prepared under the direction of Grassano's brother Enzo, who joined the team from Naples. These are less consistently wonderful: chalky calamari rings, overburdened in marinara sauce, and rigatoni in a shallow, weak Bolognese are at odds with a terrific special house-made fettuccine with clams and a lusciously oily, Sicilian-style sauteed eggplant melanzane. All of this is accomplished in an environment that smacks a bit of the cornballing inherent to many of Scott Harris's restaurants: paper place mats offering a glossary of Italian hand gestures, photographs of Vespas on cobbled streets, and some of what appear to be the very shots of Grassano and her children throwing flour at each other that hung in the last place (was Harris cropped out?). But none of this is important. The important thing, as always, is the pizza. And Grassano herself, as at all of her previous positions, is on full display in front of her massive oven, working the dough with her hands, painting each pie with her palette of toppings, and teasing them in the blazing hot oven, creating two-minute masterpieces like she was born to be there. I hope it lasts this time.